Of the leitmotifs successful startups feature in their origin myths, there is perhaps one over all others that underscores the do-or-die commitment of their founders. It's not the all-night hackathons or the dorm room littered with Skittles and Mountain Dew. It's the part where they drop out of college. From Bill Gates to Mark Zuckerberg, it seems walking out on one's college education is something a rite of passage in the accelerated world of contemporary entrepreneurship. Harvard, the alma mater of Microsoft and Facebook's founders, might one day boast more super-successful dropouts than graduates. 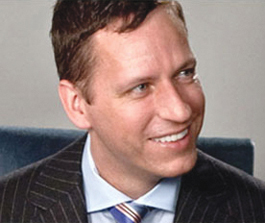 That makes perfect sense to Paypal cofounder Peter Thiel (pictured), who courted controversy several months ago when he suggested that a college education is overrated and backed it up by granting $100,000 in seed money to students who dropped out and started companies. Known as the 20 Under 20 Thiel Fellowship, $2.4 million in capital was offered to 24 candidates—of the over 400 who applied. According to Thiel Foundation head James O'Neill, "We had planned to award 20 fellowships, but the number of outstanding candidates far exceeded our expectations. It was challenging to select only 24, and impossible to pick only 20." Mind you, these aren't the typical college dropouts. Some recipients are like a hybrid of the X-Men and Doogie Howser. Consider 17-year-old Laura Deming, who began her work in biogerontology when she was 12, matriculated at MIT when she was 14 and now plans on extending the human lifespan by a couple centuries so the candles one's birthday cake will look like a bonfire. Likewise, Andrew Hsu was not like the other boys. While most 10-year-olds were playing Little League and reading Harry Potter, he was researching pathology in a lab followed by a puberty spent taking honors degrees in neurobiology, biochemistry and chemistry from the University of Washington. This year, he ditched Stanford University four years into a neuroscience Ph.D. to create iPad games for kids that make them "addicted to learning." Compensating for a lost childhood or creating a kiddie army on Thiel's dime? By the time we know, it will be too late. Of course, not all of the Thiel fellows are mental mutants—some are just Russian, like Alexander Kiselev, a 19-year-old Muscovite who's innovating an inexpensive tool to aid analysis of biochemical samples and "spark a new age of discovery." The grandiosity of some of the drop-outs' pitches aligns with their mandate to "build the technology companies of tomorrow." For fellow Dale Stephens, that "tomorrow" doesn't even include college as we know it. His aptly -named startup UnCollege claims to be "a social movement changing the notion that going to college is the only path to success." And if he's wrong, he can always go back to school.